Mosque: A mosque is a place of worship for followers of Islam. The word entered the English language most likely through French (mosquée), from Portuguese (mesquita), from Spanish, and from Berber (tamezgida), ultimately originating in Arabic: masjid. The Arabic word masjid literally means a place of prostration. The word “mosque” in English refers to all types of buildings dedicated for Islamic worship, although there is a distinction in Arabic between the smaller masjid dedicated for the daily five prayers and the larger masjid jāmi where the daily five prayers and the Friday congregation sermons are held with a high volume of attendance. Seven domed Mosque (17th century), Rose Garden (Rajbari), Atia Mosque (Mugal Element), Baitul Mukarram National Mosque, Star Mosque (18th century). Hindu Temples: A Mandir, Devalayam, Devasthanam, or a Hindu temple is a place of worship for followers of Hinduism. A characteristic of most temples is the presence of murtis (statues) of the Hindu deity to whom the temple is dedicated. They are usually dedicated to one primary deity, the presiding deity, and other deities associated with the main deity. However, some temples are dedicated to several deities, and others are dedicated to murtis in an iconic form. Many temples are in key geographical points, such as a hilltop, near waterfalls, caves and rivers; because some believe, the Purans mention, “the gods always play where groves are near rivers, mountains, and springs.”DhakashwariTemple (11th Century), Ramakrishna Mission. Churches: The Christian Church is the assembly or association of followers of Jesus Christ. The Greek term ἐκκλησία that in its appearances in the New Testament is usually translated as “church” means “assembly”. It appears in 2 versus of the canonical Gospel of Matthew, 24 verses of the Acts of the Apostles, 58 verses of the letters of Paul the Apostle (including therefore the earliest instances of its use in relation to a Christian body), 2 of the Letter to the Hebrews, 1 of the Epistle of James, 3 of the Third Epistle of John, and 19 of the Book of Revelation. The four traditional “notes of the Christian Church” are unity, holiness, catholicity, and apostolicity. In the phenomenological sense, many associations call themselves Christian churches. The New Testament the term ἐκκλησία (church or assembly) is used for local communities and in a universal sense to mean all believers. Traditionally, only orthodox believers are considered part of the true Church, but convictions of what is orthodox vary. Armenian Church (1781). St. Mary’s Cathedral at Ramna, Church of Bangladesh or former St ThomasCathedralChurch (1677) at Tejgaon. Lalbagh Fort: Prince Mohammad Azam, son of Mughal emperor Aurangazeb, built it in 1687 A.D. The fort was the scene of bloody battle during the first war of independence (1857) when 260 sepoys stationed here backed by the people revolted against British forces. Outstanding among the monuments of the Lalbagh Fort are the tomb of Pari Bibi (Fairy woman), Lalbagh Mosque, audience hall and Hammam of Nawan Shaista Khan now housing a museum. 1857 Memorial (Bhahudar Shah Park):Bahadur ShahPark, located in Dhaka, Bangladesh, is a striking war memorial set amidst the splendor of nature. It was built in 1858 at the initiative of Nawab Khwaja Abdul Ghani, in the Sadarghat area, on the ruins of an old building, called Antaghar, a club house of the Armenians, then living in a large number in the neighborhood. It was called Victoria Park until 1947. After that, it was renamed after Bahadur Shah II, the last Mughal emperor. In the late-nineteenth century, it was the centre of the Colonial city in European style with several civic and religious buildings and educational institutions around it. During the eighteenth century, the European started a club for them. They played, among other games, billiard, and hence the premise was called ‘Anta Gharer Maidan’. The English later demolished it and created a roundabout park facing the St Thomas church. The club was shifted elsewhere, which later became the famous Dhaka club. The park became a major node in the road network of old Dhaka. In the past, it had all important buildings and establishments around it, many of which are gone now. It is where the mutineers of the failed 1857 Revolt (‘Sipahi mutiny for freedom fight’) were publicly hanged. It was also the scene from where accession by Queen Victoria and India was announced amidst much funfair in 1858, and hence the original name of ‘Victoria Park’ bestowed. An obelisk to commemorate personnel was also erected there. After Partition, the historically more important monument, symbolizing this place, was erected on the Centenary of Sipahi Revolt, and the park was re-named ‘Bahadur ShahPark’. In stone throw distance around the park; important institutional buildings such as court, Bank, DC’s office and JagannathCollege are situated. Ahsan Manzil Museum: On the bank of river Buriganga in Dhaka the pink majestic, Ahsan Manzil has been renovated and turned into a museum recently. It is an example of the nation’s rich cultural heritage. It was the home of the Nawab of Dhaka and a silent spectator to many events. Today’s renovated Ahsan Manzil is a monument of immense historical beauty. It has 31 rooms with a huge dome atop which can be seen from miles around. It now has 23 galleries in 31 rooms displaying portraits, furniture and household articles and utensils used by the Nawab. Curzon Hall: Curzon hall is part of the school of science of the University of Dhaka. With its significance in education during the post independence era of Bangladesh as well as afterwards, it has become an emblem of educational tradition of the country. Curzon hall meant to be a town hall was named after Lord Curzon, the viceroy of India, who laid its foundation in 1904. A year later Bengal was partitioned and Dhaka or Dacca as it was known then became the capital of the newly created province of east Bengal and Assam. Following the annulment of partition in 1911, it was used as a premise of DhakaCollege, and after the establishment of the University of Dhaka in 1921, became part of the university’s science section and continues as such. During the language movement, Curzon hall was the location of significant events. In 1948, Mohammad ail Jinnah declared Urdu to be the only state language of Pakistan. Students of DhakaUniversity opposed it and in Curzon hall, they declared their opposition to Jinnah is planned about state language policy. Old High Court Building: The Old High Court Building in Dhaka is situated at Kazi Nazrul Islam Avenue, opposite the picturesque Curzon Hall, 13 and skipping the Ramna Green Dhaka. It was constructed in the beginning of 20th century following Renaissance architectural structure. It was built as the governor’s house of East Bengal and Assam government. After the construction of the building, the advisor of Indian government said that it was not suitable for governor’s residence. Then, it was used as general office and was given to IntermediateCollege. The High Court Building was built after the division of India in 1947. It is now under the control of Supreme Court. Now it is divided into two parts, one part is being used for crime tribunal and the other part for low commission. The old high court is situated at Kazi Nazrul Islam Avenue, opposite the picturesque Curzon Hall, 13 and skipping the Ramna Green Dhaka. Originally built as the residence of the British Governor. It illustrates a happy blend of European and Mughal architecture. Dhaka Zoo: (Bengali: ঢাকা চিড়িয়াখানা) is a Zoo located in the Mirpur section of Dhaka, the capital city of Bangladesh. The Zoo contains many native and non-native animals and wild life, and hosts about three million visitors each year. Established in 1974, the 186-acre (75 ha) Dhaka Zoo is the largest zoo in Bangladesh, and is operated by the Ministry of Fisheries and Livestock. The zoo attracts around 10,000 visitors every day with the number increasing during the weekends. The yearly budget of Dhaka Zoo is Tk 37.5 million, out of which Tk 25 million is spent on feeding the animals.The zoo is currently home to 2,150 animals from 191 species. The zoo exhibits 58 species are mammals, including elephants, cheetahs, rhinos, zebras, waterbucks, otters, hyenas, deer, giraffes, impala, black bears, tapirs, hippos, lions, many species of monkeys, chimpanzees, baboons, and Bengal tigers. The aviaries at the zoo house more than 1500 birds representing 91 species, including peacocks, rhea, African gray parrots, cassowary, owls, ostrich, emus, teals, finches, babblers, owls, vultures, and eagles. The two lakes at the zoo also host migratory water birds each winter. Visitors can also see 13 species of reptiles including snakes and crocodiles, and 28 species of fish. Popularly known as Mirpur Zoo. Colorful and attractive collections of different local and foreign species of animals and birds including the majestic Royal Bengal Tiger are available here. National Museum: originally established on 20 March 1913, albeit under another name, and formally inaugurated on 7 August 1913, was accorded the status of the national museum of Bangladesh on 17 November 1983. It is located Shah Bag, Dhaka. The museum is well organized and displays have been housed in several departments like department of ethnography and decorative art, department of history and classical art, department of natural history, and department of contemporary and world civilization. The museum also has a conservation laboratory. Centrally located, the museum contains a large number of interesting collections including sculptures and paintings of the Hindu, Buddhist and Muslim periods. Botanical Garden: The National Botanical Garden of Bangladesh, also referred to as Bangladesh National Herbarium, is the largest plant conservation center in Bangladesh, with an area of around 84 hectares (210 acres). It is located at Mirpur in Dhaka, beside the Dhaka Zoo. It is one of the greatest botanical gardens of Bangladesh and a tourist destination. It is an escape for lovely pairs and calm as well as a normal sort of a break for singles. BaldhaGarden in the Wari area of Dhaka is administratively part of the NationalGarden. National Park: Situated at Rejendrapur, 40km. north of Dhaka city. This is a vast (1,600 acres), national recreational forest with facilities for picnic etc. Central Shahid Minar: Symbol of Bangladesh nationalism. This monument was built to commemorate the martyrs of the historic Language Movement of 1952. Hundreds and thousands of people with floral wreaths & bouquet gather on 21 February every year to pay respect in a solemn atmosphere. Celebrations begin at zero hour of midnight. National Poet’s Graveyard: Revolutionary poet Kazi Nazrul Islam died on the 26 the August 1978 and was buried here. The graveyard is adjacent to the DhakaUniversity. Suhrawardy Uddyan (Garden): Popular Park. The oath for independence of Bangladesh was taken here on 7 March 1971. The place is famous for its lush verdure and gentle breezes. Mausoleum of National Leaders: Location at the south western corner of Suhrawardy Uddyan, it is the eternal resting place of three great national leaders, Shree – Bangla A.K. Fazlul Haque, Hossain Shahid Suhrawardy and Khawja Nazimmuddin. Banga Bhaban: The Banga Bhaban (Bengali: বঙ্গ ভবন, lit. House of Bengal) is the official residence and principal workplace of the President of Bangladesh, the head of state of Bangladesh. Located in the capital Dhaka, the palace has been the official residence of the British Viceroy of India until 1912, when the capital was moved to New Delhi. From 1947 to 1971, it was the residence of the Governor of East Pakistan. Since 1971, it has been the official residence of the President of Bangladesh. Every Bangladesh President since Abu Sayeed Chowdhury has lived here. During the reign of the sultanate of Bengal, on the site of Bangabhaban stood the establishment of Hazrat Shahjalal Dakhini, a Sufi saint of Dhaka. The saint and his followers were killed by the agents of the sultan and buried there. The place soon became famous as a mazhar (mausoleum) for the devotees of the saint. There is a building called Manuk House within the Bangabhaban compound. It is conjectured that it belonged to an Armenian zamindar named Manuk during the period of British India. Nawab Khwaja Abdul Ghani of Dhaka bought the place from Manuk and built a bungalow there, which he named as DilkushaGarden. With the partition of Bengal in 1905, the government of East Bengal and Assam bought the real estate and constructed a palatial house to serve as temporary residence for the Viceroy of India and used for him until 1911. From 1911 to 1947, the palace was called the Governor House, and served as the temporary residence of the governor of Bengal. Following the birth of Pakistan and India in 1947, when East Bengal officially became part of Pakistan, the palace became the residence of the governor of East Pakistan. The building was severely damaged by a storm in 1961; substantial reconstruction was completed by 1964. Baldha Garden:BaldhaGarden is an enriched botanical garden which spans 3.15 acres (1.27 ha) of land located at Wari in the old part of the city of Dhaka, the capital of Bangladesh. It has a collection of 672 species of plants. The BaldhaGarden is now managed as a satellite unit of the NationalBotanical Garden by the Department of Forestry. BaldhaGarden is one of the oldest Botanical Gardens in Bangladesh. It was established by Narenda Narayan Chawdhury. Currently located at Wari, in the Old part of Dhaka city, the traditional BaldahGarden is a satellite unit of the NationalBotanical Garden situated in Mirpur. The garden is enriched with rare plant species collected from different parts of the world. This Botanical Garden was established in 1909 by a private individual Narenda Narayan Chawdhury, a poet, philanthropist, and naturalist. He was the property owner of the state of Baldah, and he established this garden on his own property. Chawdhury passionately collected rare species of plants from different parts of the world until his death in 1943. After his death, the further expansion of the garden came to a halt. This situation continued until 1962, when the Forestry department of the Government of East Pakistan took charge of managing the garden. After the creation of Bangladesh, the garden was handed over to the new government. The Department of Forestry of Bangladesh began to work for the improvement of the garden with renewed vigor. Most of its past glory has been restored, and in addition to that, two new green houses were made. In addition, the civil amenities inside the garden were modernized. The collection of the garden is classified into seven categories – orchids, cacti, conservatory plants, aquatic plants, roses, rockery and wall plants, arboretum, and miscellaneous Flora. The garden has about 15, 0000 plants representing 672 species. Many of these are exotic and rare plants; perhaps the richest collection of exotic plants in the country is housed in the BaldahGarden. The flora of the garden represents collections from over 50 different countries. The garden has among its attractions the ‘century plant’ which is believed to flower only once in hundred years, and was seen in bloom a few years back. The Adansonia digitata tree, which adorns the garden, is historical. Central African aborigines used to seal their deeds in holes dug into the cavity of the tree in order to mummify the body long before the days of the Pharaohs. The Psyche unit of the garden houses several varieties of the aquatic plant Nymphea pubescens, the national flower of Bangladesh which is called ‘shapla’ in Bangla, maintained in a section of the garden known as the; Shapla House;. The rose garden in Cybele is famous throughout the subcontinent for its rich collection of roses. One of the two greenhouses has rich collections of orchid, aroids and conservatory plants. The BaldahGarden, although relatively small, is an exciting place for naturalists and tourists to visit. Ramna Green:RamnaPark (Bangla: রমনা উদ্যান Rômna Uddan) is a large park and recreation area situated at the heart of Dhaka, the capital city of Bangladesh. This park is one of the most beautiful areas in Dhaka with lots of trees and a lake near its center. The history of Ramna starts about 1610 AD during Mughal rule, when the city of Dhaka was founded by Subehdar Islam Khan under Emperor Jahangir. At that time, two beautiful residential areas were developed in the northern suburb of Dhaka city. New residential houses, gardens, mosques, tombs and temples were built in this area during that period. After the fall of the Mughal rule, Ramna gradually lost much of its glory. Ramna was then a barren area with bushes, abandoned or dilapidated buildings, tombs and old temples. Ramna area began to regain its glory since 1825, when Mr. Dowes, a British collector of Dhaka initiated a series of steps for development of the city. Engaging convicts, he cleared up the bushes and demolished most tombs and monuments except the Ramna Kali Mandir. The old mosque and tomb that now stand by the western side of old High Court building were spared. The renovated area was given the name of Ramna Green and was fenced by a boundary for using it as a racecourse. In 1908, he began the work of a garden that took 20 years to take a shape. The Nawabs of Dhaka developed the racecourse area as a beautiful garden and named a part of it as Shahbagh, the royal garden. The Nawabs also set up a zoo at Ramna. In 1851, the European civil servants established the Dhaka Club on the northern corner of the racecourse and after the Partition; a good number of beautiful residential houses were built at Minto road area for the High Court judges and top bureaucrats. After creation of Pakistan in 1947, Ramna area continued to occupy an important place in the history of Dhaka city. A new road from Shahbagh to the EdenBuilding was constructed and the eastern side of the road was developed as the RamnaPark. The miniature zoo with a few animals and different kinds of birds were still there at the northeastern side of the present Supreme Court building. The zoo was later shifted to its present location at Mirpur. RamnaPark was officially inaugurated in 1949 with an area of 88.50 acres (358,100 m2) of land with 71 species of plants. The large open spaces on the southwest facing the lake were used for holding National Fairs and Exhibitions. In 1960, Queen Elizabeth II was accorded a rousing civic reception at the RamnaPark with display of local fireworks. A raised concrete platform was built for the Queen, the remnants of which can still be seen in the park close to the lake. The present shape of RamnaPark was drawn up in 1952 by Public Works Department of Bangladesh (former C&B Department) and the lake was excavated and extended. Narrow pathways were built by phases. To water the rare variety of saplings, deep tube well and a bud-shape water tower were built on the northern side. The park now covers an area of 68.50 acres (277,200 m2) of which the lake takes 8.76 acres (35,500 m2). RamnaPark now boasts with 71 species of flowering plant, 36 species fruit bearing plant, 33 species medicinal plant and 41 species of forestry and 11 other species. Walkways inside park have been widened and five new gates built for entry from different sides. The Park features lot of beautiful and modern venues for relaxation. National Assembly: Jatiyo Sangsad Bhaban (Bengali: জাতীয় সংসদ ভবন Jatio Shôngshod Bhôbon) is the National Assembly Building of Bangladesh, located in the capital Dhaka. It was created by architect Louis Kahn and is one of the largest legislative complexes in the world. It houses all parliamentary activities of Bangladesh. There have been nine national elections in Bangladesh. The first and second Parliaments used the Old Shangshad Bhaban, which currently serves as the Prime Minister’s Office. Construction of the Jatiyo Sangshad Bhaban began in 1961 by the Government of Pakistan as a permanent building for the federal legislature of both West and East Pakistan. However, it was the eighth (and last) session of the second parliament of Bangladesh that first used it on 15 February 1982 after its construction was completed on 28 January of the same year. The Jatiyo Sangshad Bhaban has been in operation and has acted as the sole complex used as the National Assembly ever since. Science Museum: Located at Agargaon, the Museum is a modern learning centre related to the latest scientific discoveries. National Memorial: Located at Savar, 35 km. from Dhaka city. The memorial designed by architect Moinul Hossain, sacred memory of the millions of unknown martyrs of the 1971 war of liberation. Sonargaon: About 29 km. from Dhaka. Sonargaon is one of the oldest capitals of Bengal. A Folk Art and Crafts Museum has been established here. Other attractions in and around Dhaka include the institute of Arts and Crafts with its representative collection of folk art and paintings, handicraft shops, Aparajeya Bangla monument, picnic spots at Chandra and Salna, industrial estates of Tongi, Narayanganj Demra, Tejgaon: cruising by country boat in the nearby river or a visit to a village to see jute cultivation, weaving and pottery making. Last but not least travel by a horse driven cart or rickshaw along busy Dhaka streets is a rewarding experience. Sharine of Byazid Bostami: This holy shrine attracts a large number of visitors and pilgrims. At its base, there is a large tank with several hundred tortoises floating in the water. World War II Cemetery: In this well-preserved cemetery at a quiet and picturesque place, lie buried over 700 soldiers from Commonwealth countries and Japan. Foy’s Lake: Set amidst panoramic surroundings, this ideal sport for outings and picnics is thronged by thousands of visitors. Ethnological Museum: A unique treasure house of variety of tribal culture and heritage of Bangladesh. Court Building: Situated on the Fairy Hill, this building commands a magnificent bird’s eye view of Chittagong city particularly at night. Patenga Beach:Sandy beach at the meeting place of the roaring sea and the river Karnaphuli. Sitakund: About 40 km from Chittagong. This is famous for the ChandranathHinduTemple and the BuddhistTemple. There is a hot water spring 5 km to the north of Sitakund. Other important places of interest include Shrine of Shah Amanat, Shahi Jame Mosque, Chandanpura Mosque, Portuguese Arsenal Port Area, MarineAcademy, Biponi Bitan (New Market) and Government Circuit House built during British days. Cox’s Bazar: the tourist capital Miles of golden sands, towering cliffs, surfing waves, rare conch shells, colorful pagodas, Buddhist temples and tribes, delightful seafood this is Cox’s Bazar, the tourist capital of Bangladesh. Having the world’s longest unbroken (120 km) beach sloping gently down to the blue waters of the Bay of Bengal against the picturesque background of a chain of hills covered with deep green forests, Cox’s Bazar is one of the most attractive tourist spots in the world. The beach is good for bathing, sun bathing and swimming. The breath taking beauty of the sun setting behind the waves of the sea is captivating. Attractive local variety of cigars and handloom products of the Rakhyne tribal families are good buys. Their unique customs and costumes attract visitors. Located at a distance of 152 km. south of Chittagong, Cox’s Bazar is connected by both air and road from Dhaka and Chittagong. Visits to the fascinating picnic spot at Himchair, Teknaf, southernmost tip of Bangladesh, Buddhist temple at Ramu and nearby islands of Sonadia, St. Martin and Moheskhali are memorable experience of a lifetime. Government has taken initiatives to develop Sonadia as an exclusive beach resort. TRAVEL BANGLADESH (TRAVELBD) is a Perfect tour operator, comfortable accommodation, catering, sightseeing and other facilities for the visitor. There is a nine whole golf course also for the guests. world of panoramic beauty The hill Tracts Districts with its perennial forest, thrilling drives through hills and dales, emerald blue water of Kaptai lake, colorful tribal life and culture, attractive handicrafts and artisans beacons you to a world of panoramic beauty mother nature has so lavishly unfolded. Greater Hill Tracts is divided into three districts, namely Rangamati, Khagrachari and Bandarban each one equally unique in its attractions. Rangamati: The Heart of the Lake District: From Chittagong a 77 km. road amidst green fields and winding hills will take you to Rangamati, the headquarters of Rangamati Hill District, which is a wonderful repository of scenic splendors with flora and fauna of varied descriptions. The township is located on the western bank of the KaptaiLake. Rangamati is a favorite holiday resort because of its beautiful landscape, scenic beauty, lake, colorful tribes (Chakma, Marma etc.) its flora and fauna, tribal museum, hanging bridge, homespun textile products, ivory jewelers and the tribal men and women who fashion them. For tourists the attractions of Rangamati are numerous, tribal life, fishing, speedboat cruising, water skiing, hiking, bathing or merely enjoying nature as it is. Bangladesh Parjatan Corporation provides suitable hotel and cottage accommodation, catering, speedboat and other facilities at Rangamati. Kaptai: A pleasant and picturesque drive of 64 km. from Chittagong brings you to huge expanse of emerald and blue water ringed with tropical forest. 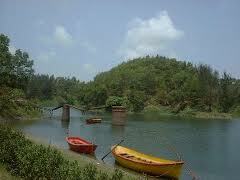 It is the famous man made Kaptai lake (680 sq. km) formed by damming the Karnophuli river. Only 3 km. from Kaptai along Chittagong Road, lays the ancient Chit Morong Buddhist temple having beautiful Buddhist statues. Other places of interest in the Hill Tract districts include Chandraghone, Khagrachari and Bandarban all in picturesque surrounding. Next to the Hill Tracts, Sylhet is the widely hilly district in the country. Nestled in the picturesque Surma valley amidst scenic tea plantations and lush green tropical forest, it is a prime attraction for all tourists. Its terraced tea gardens, eye catching orange groves and pineapple plantations and hills covered with tropical forests form a beautiful landscape. The Sylhet valley has a good number of haors, which are big natural wetlands. During winter, these haors are vast stretches of green land, but in the rainy season, they turn into a turbulent sea. These haors provide sanctuary to the million of migratory birds who fly from Siberia across the Himalayas to avoid the severe cold. Srimangal in Sylhet, known as the tea capital of Bangladesh, is the main tea centre of the area. For miles and miles around, the visitor can see the tea gardens spread like green carpet over the plain land or on the sloping hills. A visit to the tea plantation in Sylhet is a memorable experience Sylhet the tea granary of Bangladesh, not only has over 150 tea gardens but also proudly possesses the tree largest tea gardens in the world both in area and production. Sylhet is also known as the land of the famous Muslim saint Hazrat Shah Halal the great torchbearer of Islam to the region. The Shrine of this great saint is located at Sylhet town. Colorful Monipuri, Khasia and Garo tribes live in Sylhet. Monipuri tribal maidens are famous for their dance. Sylhet is also well known for its wide variety of exquisite handicrafts of cane and bamboo. Tea Plantation: Tea is the heart of life in the Sylhet division. It produces over 55 million kg of tea annually from more than 150 tea estates spread over 40,000 hectares. You can stroll in the tea estate, wander a short way into the bushes, talk to the tea-pluckers, and learn something about the processes that culminate into our morning tea. Madhabkunda Waterfall: The picturesque Madhab-Kunda waterfalls are the largest waterfall in the country. The surrounding hill forests, supporting some wildlife, are well worth the two hours northeast drive from Srimongal or 3 hours southeast drive from Sylhet. Here you may also see elephants being used to haul huge logs. There is a Parjatan Tourist spot nearby, with a restaurant, picnic area and toilet facilities. Haors – Sunamganj: Situated below the foothills of the Himalayas, the vast wetlands, locally known as ‘haors’, attract huge flocks of migratory birds in the winter months (October- March). The Sunamganj wetland area is unspoiled and remains largely unexplored by tourists. Cruising through the shallow and clear waters is a special treat for birdwatchers and nature lovers alike. Varieties of rails, raptors, ducks, sandpipers and others congregate in these haors of Sunamganj. Tribal Villages: There are 11 Khasia villages called “Punji” and several Monipuri villages called “Para” scattered among the tea plantations spreading in Srimongal and Sylhet areas. Khasia villages are usually on hilltops surrounded by betel nut trees, which is their cash crop. In the Monipuri “Para”, you can see the traditional weaving. You can also buy the traditional crafts as souvenirs. Holy Shrine of Hazrat Shah Jalal: It is situated in the North of Sylhet city, off the airport road. The tomb of Hazrat Shah Jalal, a Sufi saint during the 14th century, is located inside the shrine complex. It is one of the biggest pilgrimage sites in the country and a fascinating place to visit. Hazrat Shah Jalal’s sword and robes are preserved within the large new mosque, but are not on display. The tomb is covered with rich brocade, and at night, the surrounding places are illuminated with candles. Holy Shrine of Hazrat Shah Paran: About 8 km east of Sylhet, just off the highway to Jaintiapur, is the Shrine of Shah Paran in the tiny village of Shah Paran. A single- domed mosque attracts about 2000 pilgrims a day. Lawachhera National Park: Located about 8 km east of Srimongal, this 1250-hectare park is a beautiful, semi-evergreen tropical forest locally known as Shyamoli. It has the country’s largest population of critically endangered Hoolock gibbons – the subcontinents only ape species – as well as a large variety of mammals, birds and orchids. Lawachhera is home to 19 mammal species including the capped langur, the delightful slow loris, orange-bellied Himalayan squirrel and barking deer. Some 246 species of birds have been identified, which includes the blue-bearded bee-eater and the red-breasted trogon. Satchhari National Park: This 243-hectare park is situated in Hobiganj, 60 km southwest of Srimongol. Though less popular than Lawachhera, it has a higher diversity of plants and animals and far less human disturbance. It has seven streams – origin of the name “satchhari”, a population of hoolock gibbons, fishing cats, phayre’s langur, jungle fowl, pygmy woodpeckers and oriental pied hornbills. Rema Kalenga Wildlife Sanctuary: Located near SatchhariNational Park, it is the country’s largest natural hill forest with a variety of plants, animals and birds and four different ethnic forest communities. Tamabil – Jaflong Situated amidst splendid panorama, Tamabil is a border outpost on Sylhet- shilong Road, about 55 km away from Sylhet town. Besides enchanting views of the area, one can also have a glimpse of the waterfalls across the border from Tamabil. Jaflong is also a scenic spot nearby amidst tea gardens and rare beauty of rolling stones from hills. Other places of tourist attraction in Sylhet include Moulvibazar, Janitipur, and Madhabakunda and Haripur gas field. Lalakhal: This astonishing place ‘Lalakhal’ is located at Jaintiapur in Sylhet. The name of the river is ‘Sari’, which is famous for its high-quality sand for construction. This place has been inapproachable for a long time because of unavailability of vehicles. Still, if boats are unavailable, after reaching ‘Sarighat’ by bus (around 30 KM from Sylhet Metropolitan city), you have to make that 8 KM road by walking. Located near Khulna about 320 Km. west of Dhaka. Here in the south, spread over an area of about 6000 sq. km. of deltaic swamps along the coastal belt of Khulna is the biggest mangrove forest, Sundarbans (beautiful forest)- the home of the Royal Bengal Tiger. Its dense rain forests are crises crossed by a network of rivers and creeks. One finds here tides flowing in two directions in the same creek and often tigers swimming across a river or huge crocodiles basking in the sun. Other wildlife in this region is cheetahs, spotted dears, moneys, pythons, wild bears and hyenas. The forest is accessible by river from Khulna and Mongla. There are rest houses for the visitors to stay and enjoy the unspoiled nature with all its charm and majesty. Spending sometimes inside the forest can be a rear treat for the lovers of nature. Kuakata a rare scenic beauty spot on the southernmost tip of Bangladesh in the district of Patuakhali. 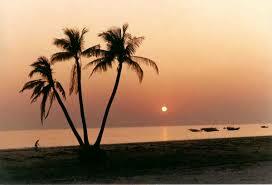 It has a wide sandy beach from where one can get the unique opportunity of seeing both the sunrise and sun setting. It is located at a distance of 70 km, from the district headquarters of Patuakhali. Access to the area is difficult. About eight km. to the west of Comilla town, which is situated 114 km southeast of Dhaka, lays a range of low hills known as Mainamati-Lalmai ridge, an extensive centre of Buddhist culture. On the slopes of these hills lie scattered a treasure of information about the early Buddhist cMlization (7th-12th Century A.D.). At Salban in the middle of the ridge, excavations laid bare a large Buddhist Vihara (monastery) and imposing central shrine. It has revealed valuable information about the rule of the Chandra and Deva dynasties, which flourished here from the 7th to 12th century. The whole range of hillocks run for about 18 km. and is studded with more than 50 sites. A site museum houses the archaeological finds, which include terra cotta plaques, bronze statues and casket, coins, jewelers, utensils, pottery and votive stoops embossed with Buddhist inscriptions. Museum is open Sunday-Friday and closed on Saturday. BangladeshAcademy for Rural Development (BARD) established nearly in 1959 is known for its pioneering role in co-operative movement. Located at a distance of 18 km north of Bogra town. Mahasthangarh is the oldest archaeological site of Bangladesh on the western bank of river Karatoa. The spectacular site is an imposing landmark in the area having a fortified long enclosure. Beyond the fortified area, other ancient ruins fan out within a semicircle of about 8 km radius. Several isolated mounds, the local names of which are GovindaBhitaTemple, Khodia Pathar Mound, Mankalir Kunda, Parasuramer Bedi, Jiyat Kunda etc. surround the fortified city. This 3rd century B.C. archaeological site is still held to be of great sanctity by the Hindus. Every year (mid – April) and once in every 12 years (December) thousands of Hindu devotees join the bathing ceremony on the bank of river Karatoa. A visit to the Mahasthangarh site museum will open up for one a wide variety of antiquities, ranging from terra-cotta objects to gold ornaments and coins recovered from the site. Also noteworthy are the shrine of Shah Sultan Bulki Mahisawary and Gokul Moth in the neighborhood of Mahasthangarh. 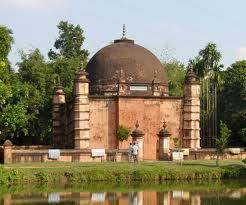 Rajshahi has seen the most glorious periods of Bengal’s Pala dynasty. It is famous for pure silk, mangoes and lichis. Attractive silk products are cheaper. A visit to VarendraResearchMuseum at the heart of the city of rich archaeological finds would be most rewarding. There are also a number of ancient mosques, shrines and temples in and around Rajshahi. Connected with Dhaka by road, rail, river and air, Rajshahi is located on the bank of the PadmaRiver. Bangladesh Parjatan Corporation offers comfortable accommodation and restaurant facilities at Rajshahi. About 40km. from Rajshahi by road is Natore, an old seat of Maharajas with a beautiful palace, now serving as the Uttara Ganabhaban (President’s Official residence of the northern region). It was residence of the Dighapatiya Raj. It is situated amid well-kept ground surrounded by a fine moat. The buildings are modern. They include a well-equipped guesthouse, an imposing gateway and a fine garden decorated with statues of white marble. Paharpur is a small village 5 km. west of Jamalganj in the greater Rajshahi district where the remains of the most important and the largest known monastery south of the Himalayas has been excavated. This 7th century archaeological find covers approximately an area of 27 acres of land. The entire establishment, occupying a quadrangular cout, measuring more than 900 ft. and from 12 ft. to 15th. In height. With elaborate gateway complex on the north, there are 45 cells on the north and 44 in each of the other 3 sides with a total number of 177 rooms. The architecture of the pyramidal cruciform temple is profoundly influenced by those of South – East Asia, especially Myanmar and Java. It had taken its name from a high mound, which looked like pahar or hillock. A site museum built recently houses the representative collection of objects recovered from the area. The excavated findings have also been preserved at the VarendraResearchMuseum at Rajshahi. The antiquities of the museum include terra-cotta plaques, images of different good and goddesses, potteries, coin inscriptions, ornamental bricks and other minor clay objects. Interest tourists may avail “Palace & Archeological Tour Dhaka – Natore – Rajshahi- paharpur – Mahasthangarh – Bogra – Natore – Dhaka”. The northern most district of the country, offers a number of attractions to the visitors. The Ramsagar (great sea) lake with rest houses is a good picnic spot having facilities for fishing and rowing in a serene and quiet green countryside atmosphere. Kantanager temple, the most ornate among the late medieval temples of Bangladesh is situated near Dinajpur town. It was build by Maharaja Pran Nath in 1752 A.D. Every inch of the temple surface is beautifully embellished with exquisite terra-cotta plaques, representing flora, fauna, geometric motifs, mythological scenes and an astonishing array to contemporary social scenes and favorite pastimes. The Maharaja’s palace with relics of the past centuries and local museum are worth a visit. Shilaidaha Kuthibari Carries memory of the Nobel laureate poet Rabindranath Tagore who made frequent visits to this place and used to stay in connection with the administration of his jamindari and enriched Bengali literature through his writings during that time. It is located at a distance of about 20 km. from Kushita town. Shahjadpur kuthibari About 75 km. from Pabna town, it is also a historical place connected with the frequent visits of poet Rabindranath Tagore. Sagardari Birth place of modern Bengali poet Michael Madhusudhan Datta who first introduced sonnet in Bengali poetry. Located at a distance of about 90 km. from Jessore town. Meherpur Memorial Located at a distance of about 7 km. from the town of Meherpur. First provisional revolutionary Government of Bangladesh was declared here on 14 April during the liberation war in 1971. A monument has been built to commemorate this occasion.